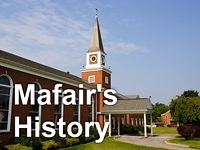 3:30-5:30 PM Mafair serves @ Kitchen of Hope: All interested volunteers are welcome... located at Full Gospel Mission Church, 740 E. Sevier St. Food preparation begins around 2 PM. 6 PM Benefit show with four bands @ The Fire Escape Christian Teen Club. The club still has openings for its Performing Arts Afterschool program, 3:30-6:30 PM, Monday through Friday. For more information, call 723-7283. 5:30 PM Church Picnic at Eastman Shelters 28 & 30 followed by Back-to-School Family Olympics in field behind shelters. Sun., August 19 Children's "Rally Day" (Promotion Sunday) where the children will participate in a "scavenger hunt" to some adult classrooms and then be recognized during Worship.